Do you wish there was a way to help fast track your weight loss results? Eating healthy meals and training consistently are KEY when it comes to slimming down. But supplementing your work with the best fat burning supplements can give you the boost you're looking for to take your results to a new level. Weight loss is both a mental and physical battle. Dieting can leave you feeling tired, grumpy, and make it hard to stay motivated on your weight loss journey. Fat burning supplements, when formulated with quality ingredients, can provide weight loss benefits like improving your metabolism, and help boost fat burn.The best fat burning supplements also provide additional benefits like mood and energy support, so you can feel your best on your weight loss journey. 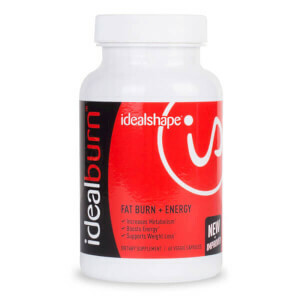 That’s why IdealShape created it’s most popular supplement IdealBurn, a fat burner formulated with ingredients like green tea leaf extract, natural caffeine, L-carnitine, and L-tyrosine and more to boost your weight loss results, energy, and help support your mood. While there is no such thing as a miracle pill, a well designed fat burners can give you an extra boost to help you achieve your weight loss goals by providing additional weight loss advantages as well as energy and mood support. How should I use IdealBurn?